Kasper Kesje wears black high top Converse “Chuck Taylor” All Stars in the films Living Large, Home Field Advantage, In Japanese Mode, and Back to Nature. 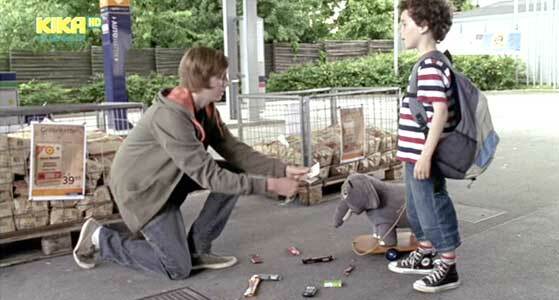 Jakob Wilhjelm Poulsen wears black low cut Converse “Chuck Taylor” All Stars in the film Never Gives Up. 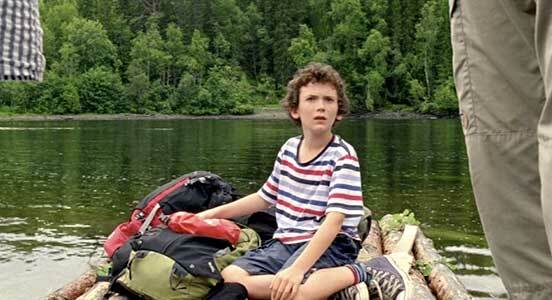 Jakob Wilhjelm Poulsen wears optical white high top Converse “Chuck Taylor” All Stars in the film Living Large. 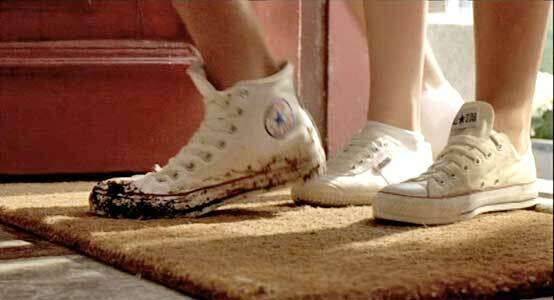 Kathrine Bremerskov Kaysen wears optical white high top Converse “Chuck Taylor” All Stars in the film Never Gives Up. Sidse Mickelborg wears white low cut Converse “Chuck Taylor” All Stars in the film Living Large. Søs, Uncle Anders, Mie, Ole, and Per watch the jousting competition in Living Large. In the 1950’s, the first set of Father of Four films were produced. The series about a typical Danish family led by a single father with four children became very popular and eight films were made between 1953 and 1962. 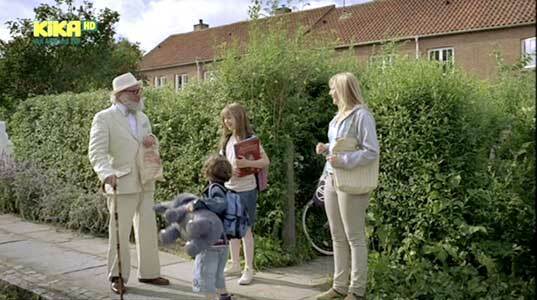 Their eccentric Uncle Anders was another recurring character. The films achieved success later in video cassette sales, and for family viewing on Danish public television. In the year 2005, film director and producer Claus Bjerre began remaking the films with new stories and a more contemporary look. The stories involve day to day issues of the four children at school, among their friends and activities, or the father at work combined with more unusual events, like Under Anders inheriting a castle, dad winning a lottery at work then losing the ticket, or a Japanese family moving in next door. Bjerre was responsible for the first six remade films before turning the series over to another writer/director, Giacomo Campeotto. At the start of Never Gives Up, Uncle Anders, Per, Mie and Søs wait for Ole and their dad. In the series, Dad (Niels Olsen) is a widower or single father, although how that came about is something never explained by the writers of the original series. The children are so cheerful and well adjusted it would seem that they weren’t abandoned or separated from their mother by a divorce. In fact the topic of their mom never comes up in the stories. Dad is portrayed as lovable and bumbling at times, but loyal and protective of his children, very typical of family situation comedies. Of the four kids Per (Kasper Kesje), the youngest boy who is about 7-8 in the first film is the most interesting and responsible for much of the action involving the kids. He is always seen wearing black high tops, striped shirts and striped socks, and doing things with his favorite toy elephant. Per’s older brother is Ole (Jakob Wilhjelm Poulsen), Ole starts out as a tween, and quickly grows into a young teenager by the second film. 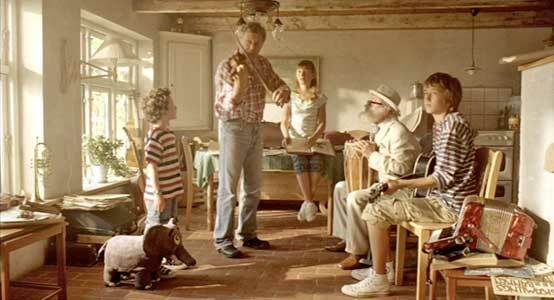 Ole is musical, plays the guitar and sings, and forms a band. Later he becomes involved in skateboarding. 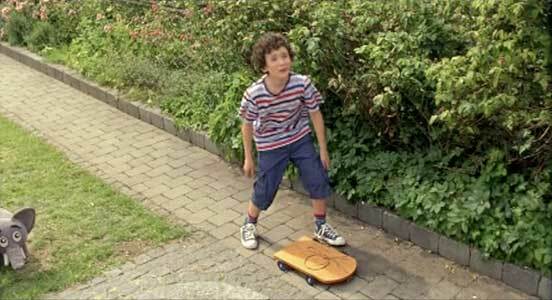 In the first film he wears black low cut chucks, in the second film white high top chucks, and then switches over to skater footwear and fashion in the following films. Like Per he wears striped shirts, hoodies, and shorts or jeans. Mie (Kathrine Bremerskov Kaysen), the young daughter is a year or so older than Ole. Mie wears optical white high tops chucks in the first film, and after that white generic sneakers along with jeans shorts and skirts, and casual blouses. The oldest daughter, Søs (Sidse Mickelborg), is college age and acts as the surrogate mother at times. Søs is athletic, and meets her boyfriend, Peter (Søren Bregendal) when he arrives at her practice to take a team photo. Their ongoing romance and eventual marriage plans are a subplot in all of the films. Søs wears white low cut chucks in the second film, but is more fashion conscious in her attire, usually wearing dresses and has an interest in modeling. 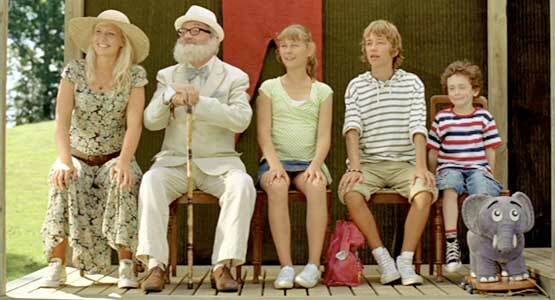 Uncle Anders (Jess Ingerslev) is their eccentric uncle who lives nearby. He is normally dressed in a white suit with bow tie, and reminds one a little of Colonel Sanders in appearance. 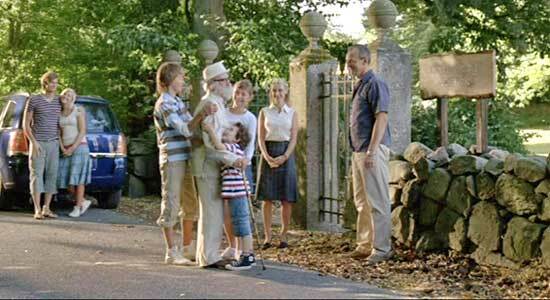 Overall in these remade movies, the family seems very American in their dress and many of their activities. The family stands outside the entrance to the castle in Living Large. The first Father of Four film, Never Gives Up! (2005), introduces us to the family as they wake up in the morning. First we see the dad stumbling out of bed as the alarm rings, then we are introduced to each of the four kids in their rooms. Per is playing with his toy elephant, Ole is jamming on his guitar, Mie is carefully organizing her schoolwork, while Søs is getting dressed and then helping with breakfast. Later as the family is waiting for Dad and Ole to get in the car to go off to school and work, we meet Uncle Anders walking down the street. There we begin to see the special relationship that Per has with Uncle Anders. Ole and his classmate play tonettes at school in Never Gives Up. The main storyline of the film involves Dad, who gets fired from his job as an accountant because his boss thinks he’s too boring and doesn’t fit the company’s new progressive profile. As a single father of four he has to pull out all the stops to get his job back, and the children don’t hesitate to suggest how Dad’s image can be made more up to date. It is a sweet element of the film how the children rally to help their father however they can. Per solves the family’s financial problems in his own creative way. Nothing seems to phase Per and he goes about accomplishing things in a most surprisingly direct way for someone his age. Other subplots involve Mie, who has taken on the responsibility of arranging a huge talent show at school, but is frustrated by technical problems and bad luck. Ole struggles to form a band and later on to keep it together. Søs starts to work as a model but ends up falling in love with Peter. Per and the von Grissenfeldt’s young daughter look at the two families standing off in Living Large. The second Father of Four film, Living Large (2006) begins with the family getting ready for a holiday, packing up the car, and getting ready to drive to a vacation home in Bornholm that Dad has rented. Just as they are about to leave Uncle Anders receives a letter informing him that he has inherited the Krageholm Castle, so the family changes plans and set their course for the castle at Funen. However, when they arrive, it turns out that Uncle Anders is not the sole heir. The snooty Von Grissenfeldt family are also entitled to the castle, and according to the will, the two families have to engage in a three part competition to settle the matter. The Grissenfeldt family uses dirty tricks in order to secure the victory, and they will do anything in their power to win. The three parts of the competition are jousting, a tennis match, and a dancing contest. Dad agrees to be the jouster, but loses because the Von Grissenfeldt boys loosen his saddle so he will fall off. They are also winning the tennis doubles tournament until Uncle Anders is knocked to the ground, jogging his memory of when he was a tennis champion at a young age. He then rallies a furious comeback with Søs, and the contest is tied at one apiece. The family confronts some low life criminals in Back to Nature. Meanwhile, Per and the other kids explore the dark hallways of the castle and discover that the castle has a real ghost, who looks very much like Uncle Anders. They discover an old book that contains a song about the legend of the castle, and meet a neighbor who knows the song. They believe that this song will be the one used for the dance competition which will give them the edge in the competition. But the Von Grissenfeldts again conspire against them and we discover their real motive for wanting the castle. There is one more subplot. Søs and Peter have had a falling out, when Peter has to cancel going on vacation with the family at the last moment. When he comes to Funen later to try and make things right, Søs is being charmed by the eldest Von Grissenfeldt son, who is wooing Søs to get her off balance for the competition. Ghosts, intrigue, treachery, and true love all play into the ending of the story. Performing the Legend of Krageholm Castle song in Living Large. Father of Four film number three is entitled Home Field Advantage (2008). In this continuation of the series, Dad is very much involved in team building activities at work. These include physical activities at an outdoor park and fun activities like chipping in on lottery tickets. As team leader, Dad holds onto the lottery ticket. The ticket ends up winning a large prize, but then Dad’s wallet is stolen and he doesn’t know how to tell the others, so he plays absent minded, saying he forgot it at home. But there is a serious problem with a pickpocket who has been doing a lot of stealing lately. Eventually Per and Uncle Anders get involved to try and get the ticket back by baiting a trap for the thief, and eventually Per goes off on his own, after he believes that he has figured out the identity of the pickpocket. For Ole, skateboarding has become and important part of his life. He participates in a local contest where he meets Stella, a skater girl who also has some musical abilities. Stella is into more of a counterculture lifestyle and wants to change Ole’s look, adding purple dye to his hair among other things. Among the sisters, Mie and her friend are shooting their own music video. Søs worries that her boyfriend Peter will forget their second anniversary of being together. But everyone rallies when they discover Per is missing. 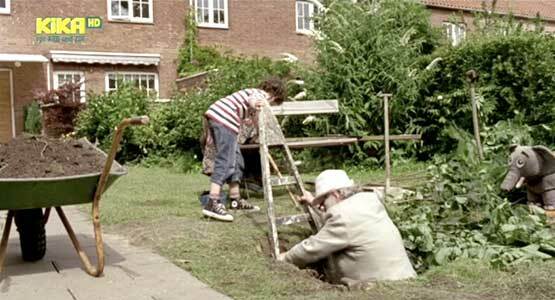 Per and Uncle Anders prepare a trap for the thief in Home Field Advantage. Father of Four film number 4 is In Japanese Mode (2010). As the film begins, the family gets new neighbors from Japan and helps the Tanaka family get settled into their new home and country. The Tanaka’s have a young son Shin who is Per’s age, and the two soon become best friends. Per and his family help the Tanaka’s feel welcome and learn about Japanese customs and lifestyle. The Tanaka family can fit in because they have learned to speak Danish. It is important for them to fit in and feel at home; otherwise Japanese custom dictates that they should return to where they came from. It is at school where Shin has problems, because he isn’t as loose and outgoing as the other kids, making it hard for him to fit in with school activities. When an older kid, Mark, and his friends start to bully Shin, he fights back with judo moves that cause quite a stir. Per and Shin try to hide this from Shin’s parents, but when things erupt into a fight, the school administration gets involved. Mr. Tanaka is mortified when he is called into the principal’s office, and later decides that he should take his family back to Japan. Before they are scheduled to leave, they go on a class field trip to the zoo. When Mark’s careless and mean actions cause another student to fall into the water of the lion’s den, Per and Shin work heroically to rescue her. Now Shin is recognized as a hero, and things come to a happy ending. Per is pursuing a thief in Home Field Advantage. Father of Four film number 5 is Back to Nature (2011) The family leaves to spend a weekend in Sweden where they will visit Dad’s cousin Annika. Annika’s birthday coincides with this year’s midsummer festival at the nature park she runs. At first things go well. The family enjoys camping out and appreciating the beauty of the park. Dad happily shows the children where he played as a boy, hiking, swimming, and fishing. Even Uncle Anders seizes the opportunity to put on his old scout shirt and take out his compass. But soon a dark cloud comes over their vacation. A gang of low life rednecks, led by a man called Rikart, is using the park as a dumping ground for old appliances and hazardous waste. Annika is afraid to contact the authorities because Rikart has threatened to harm her elderly father, Gubben. When the family of four sticks up for Annika and gathers evidence against Rikart, he comes after them, chasing them to the river that cuts through the park. After they cross the the small suspension bridge over the river, Rikart cuts it down, stranding them on the wild side of the park. Then Annika is imprisoned and her phone cut off so that she can’t call the police or outside rescuers. Now on their own, Dad and the others must fend off bears and figure out how to get back to the other side. This leads to an exciting raft adventure with Per when the rafts floats off into the river. Luckily Gubben helps rescue them and the others, and they set a trap for the bad guys. Per looks up at his father who is trying to move a heavy luggage case in Back to Nature. The Father of Four series is typical family situation comedy in its plots and action, although the later films have nasty bad guys and more perilous situations for Per and his family so parental guidance would be recommended for very young kids. One thing that you notice in the films is how much influence American fashions and life styles have had on modern Danish life, although that is somewhat of a world-wide phenomenon. On the other hand, European films are also much more open about what they are willing to show. American family films have fairly strict taboos on showing things like kids smoking (In Japanese Mode), wearing nose rings and having tattoos (Home Field Advantage), or unmarried couples being in bed together (Living Large). The characters all seem quite accepting of each other, regardless of their life styles, ages, and appearances. The Danish also seem more tolerant of the bad guys than Americans. At the end of Home Field Advantage we see the thief being counseled and forgiven for a very long string of crimes. At the end of Back to Nature we see Rikart and his cohorts in green jump suits doing community service in the park rather than spending time in a cell. The Claus Bjerre directed films are available in a Region 2 DVD with English subtitles. Per is on a makeshift raft in Back to Nature. Ole’s white high tops are covered with mud as he and his sisters are about to enter Krageholm castle in Living Large. 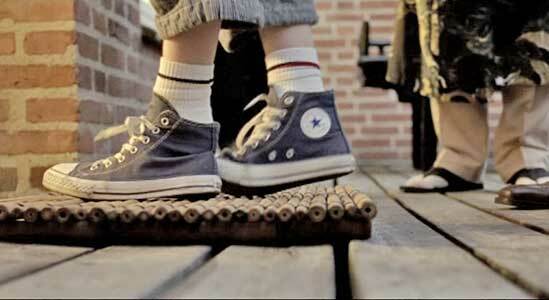 All four of the children wear chucks at one time or another in the films. Per is the most consistent wearer sporting black high tops in all of the films. He is always seen wearing a striped shirt, shorts or dungarees, striped socks and black high top chucks. As Per is about to kick off his black high top chucks, the camera shows a closeup In Japanese Mode. There are a few good close up shots in the films, and as the content of the films focuses on Per much of the time, we see lots of shots of him throughout the series. 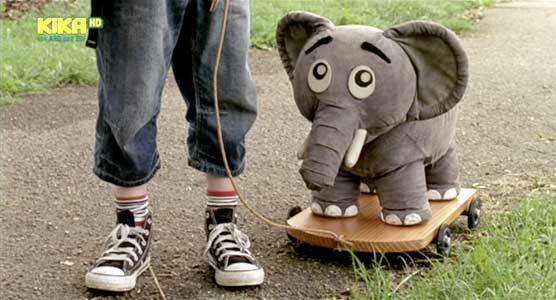 Camera close up of Per’s black high tops and his elephant toy in Home Field Advantage. The Father of Four Series. (2005-11) Niels Olsen, Kasper Kesje, Jakob Wilhjelm Poulsen, Kathrine Bremerskov Kaysen, Sidse Mickelborg, Jess Ingerslev, Søren Bregendal. Directed by Claus Bjerre. Categories: Family, Comedy.